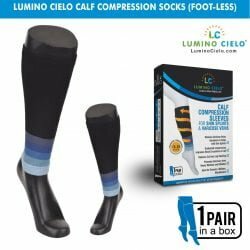 Compression socks are a product that provides therapeutic compression to promote circulation in the legs and treat various disease conditions. Compression socks or stockings can be found on the legs of a wide swath of the population, from pilots, flight attendants, runners, and nurses to pregnant women, people recovering from surgery, and people otherwise at risk for blood clots in their legs. Compression stockings come in a variety of sizes, lengths and colors. They’re also available with different strengths of compression. Your legs will be measured to see what size stockings you need. 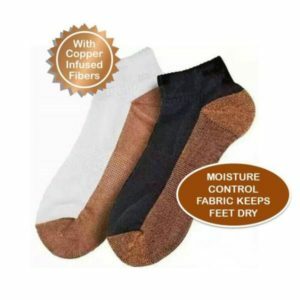 These socks are made of a strong, elastic fabric that often runs from the foot to the thigh at different pressures based on the amount of pressure required. Varicose and Spider Veins: If you suffer from varicose veins and spider veins, you know firsthand the frustration of dealing with fatigue, swelling, itching, burning, and leg cramps. Compression socks help reduce the symptoms of painful varicose veins and when worn faithfully, they slow the progression of vein disease. However, compression alone does not correct the underlying vein problem. Overcomes the Gravitational Affect: Compression socks promote the venous blood flow from the feet back toward the heart overcoming the effects of gravity. 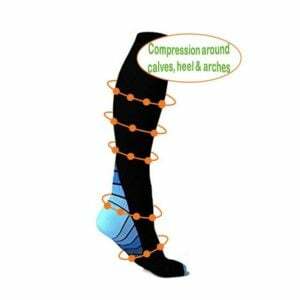 Medical grade graduated compression is designed to be stronger in the feet and gradually diminish in pressure as they extend up the calf into the thigh. Properly designed and fitted compression socks prevent venous blood pooling in the legs and feet, improve leg symptoms, and decrease the risk of blood clots. For Deep vein thrombosis (DVT): The clearest benefit is for people with certain leg problems or at risk for blood clots in the legs, known as deep vein thrombosis (DVT). Many factors can increase the risk of these clots, including prolonged bed rest (such as after surgery), sitting for long periods (such as on a plane), use of birth control pills or hormone replacement therapy, pregnancy, family history of DVT, inflammatory bowel disease, and certain genetic clotting disorders. Compression stockings are also sometimes used in people who have an acute DVT, to prevent a group of symptoms known as post-thrombotic syndrome that includes leg pain and swelling. Runner and Athletes: Compression socks have been making their way onto plenty of runners and athletes from other sports to help them possibly improve their performance. Compression sleeve or sock helps you when you’re running. But when it comes to post-exercise it reduces delayed onset muscle soreness. There’s also a psychological benefit to wearing items like a compression calf sleeve, tight, and other gear because you “feel” like you’re doing something to actively help your recovery and boost your performance for the next run. That’s the reason why compression clothing is mostly used by men and women in attempt to recover from a hard run or workout, along with after races, as quickly as possible. For CrossFit: Just like running, CrossFit puts a lot of strain in your legs. But unlike running strain is felt by the leg not on a regular constant pace but sudden movements, stretches and pulls. The benefits that you get from compression socks are practically the same as that for running. Compression socks lessen the instances of cramps and help your leg recover faster from the leg strain. Better circulation: Still wondering how compression socks work? This may help it make sense: compression socks involve graduated compression in its design. Because of this, the varying degrees of tightness along the length of the compression sock, blood flow is improved. The compression decreases as the sock goes up the leg. 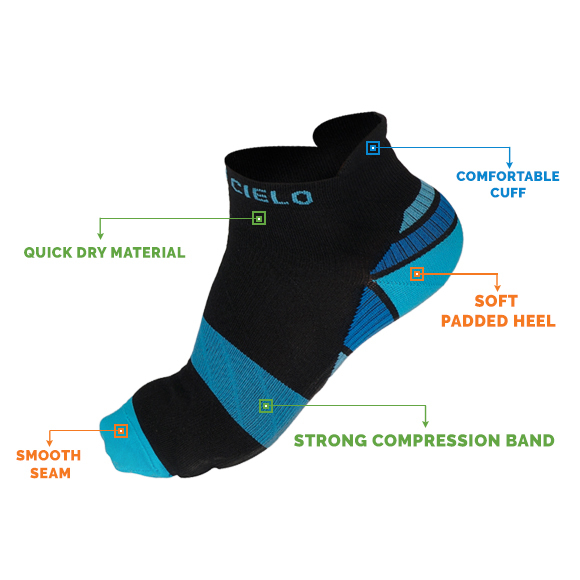 This allows for better circulation that doesn’t get pinched off by the tightness of the compression sock. Prevent Stagnation and Poling of Blood: If you’re sitting for long periods of time, compression socks can help. On the other hand compression socks have been proven to limit swelling, especially in people who spend all day on their feet. They are elastic and provide measured pressure against the legs so as to reduce the size of distended veins, increase blood flow and prevent the stagnation of blood in the veins and the pooling of fluids in extracellular spaces. Prevent Backflow of Blood: Another benefit of compression stockings prevents blood from flowing backward and causing congestion in blood vessels. This congestion can lead to an increased risk for blood clots and other serious health complications. Treat Lymphedema: Edema, or leg swelling, is a problem that thousands of people suffer from needlessly. Using compression socks is the best way to reduce the swelling without medications. Compression socks also stimulate the venous and lymphatic drainage of the legs. For Pregnant Ladies: Many women experience swollen, heavy legs during their pregnancies. One in two pregnant women will develop varicose veins as a result of the swelling. The moment a woman conceives, her body begins to change. During pregnancy hormones dilate the blood vessels to carry extra blood for the baby. With a family history, this is when valves in veins may start to fail. Compression socks reduce that and can slow down the process with future pregnancies. Treating Arthritis: Arthritis can make you feel cold and achy. Compression socks provide you warmth and stabilize the joint during activity, reducing strain and allowing it to stay active while easing pain. For Travel: Compression socks are best for travel because of the walking and waiting in the airport that you do. Compression socks are recommended for people who travel abroad, not just the elderly but people who have a pre-existing problem or prone to develop leg problems. Moreover, the benefits of compression stockings are dependent on wearing the stockings properly for example, if the socks were worn wrinkled that could lead to new or worse problems, since bunching or wrinkling can exert excess pressure on the skin. Typically, the stockings are safe and wearing them results in few or no complications, provided they’re worn smoothly against the leg, without any folds.